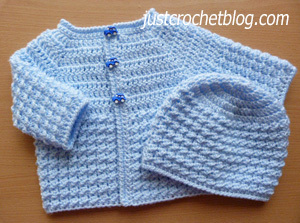 Crochet baby glitz coat-hat a free crochet pattern for a 16″ chest 0-3 month baby, made in a worsted weight #3 yarn on 4.00mm and 4.50mm crochet hooks. Commence Skirt – Change to 4.50mm hook, ch1, sl st in base of ch1, * 1dc in next dc, sl st in next dc, * rpt from * to * to end. Turn. Next Row – ch2, 1hdc in base of ch2, 1hdc in each dc and sl st to end. Turn. Pattern Row 1 – ch1, sl st in base of ch1, * 1dc in next hdc, sl st in next hdc, * rpt from * to * to end. Turn. Pattern Row 2 – ch2, 1hdc in base of ch2, 1hdc in each dc and sl st to end. Turn. Second Row – ch1, sl st in base of ch1, 1dc in next dc, * sl st in next dc, 1dc in next dc, * rpt from * to * to end, sl st to first sl st on beginning of row. Turn. Buttonhole Band – With WS facing, join yarn to lower edge of front edge, ch1, 1sc in base of ch1, work 37 more sc evenly in row ends up first front, 3sc in corner, 1sc in each ch around neck edge to next corner, 3sc in corner, work 38sc evenly in row ends down second front edge to end. Turn. Buttonhole Row – ch1, 1sc in base of ch1, 1sc in each sc up first front, work 3sc in corner, 1sc in each sc around next, 1sc in corner, * ch2, skip 1sc, 1sc in next 7sc * rpt from * to * once, ch2, skip 1sc, 1sc in each of remaining sc to end. Next Row – Working in all sc and ch2 spaces work 1 row of crab stitch up first front, around neck and down second front. Fasten off. Using 4.00mm hook ch6 and join with a sl st to form a ring, ch3, work 13dc in ring, join with sl st to top of ch3 on beginning of row. Row 6 – ch1, * sl st in next dc, 1dc in next dc, * rpt from * to * to end, sl st to first sl st on beginning of row. Turn. Row 8 – ch1, sl st in base of ch1, 1dc in next hdc, * sl st in next hdc, 1dc in next hdc, * rpt from * to * to end, sl st to first sl st on beginning of row. Turn. 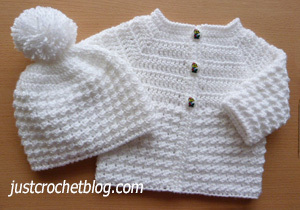 Hope you enjoy this free crochet baby glitz coat-hat pattern, don’t forget to pin! Hi Hearther thank you for the cute outfits i have 6 new great granddaughters and 1 new great grandson they would love the outfits , i already started so looking forward to making them any boys little outfits ? They will keep that crochet hook busy for you Sonja. 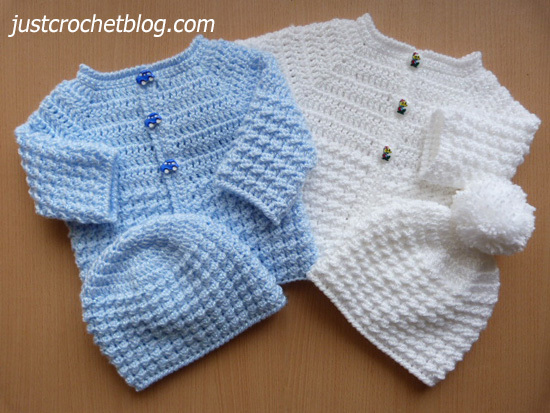 I have a couple of boys patterns, but have look on the free crochet patterns category page where all my patterns are shown.